Today is Olympus day with the announcement of eight new cameras in the FE, Stylus (Mju) and SP ranges. Most interesting is the SP-550 UZ ultrazoom, boasting the world's first 18x (yes 18x) zoom capability. Covering an astounding 28-504mm (equiv.) range it is sure to appeal to travellers seeking a compact camera for all occasions. Also featuring CCD-shift Image Stabilization, a 15fps burst mode (1.2MP) and a 7.1 megapixel sensor, the SP-550 continues a legacy of innovative large-zoom cameras from Olympus. London, 25 January 2007 – Get up close and personal in a whole new way. With the world’s first wide 18x optical zoom, the Olympus SP-550 UZ accepts no limits, bringing photographers closer to distant subjects than ever before. Capture candid street scenes from a discreet distance, grab the detail of your favourite sport from way up in the stands – then even use the wide angle lens to take in the whole game – as this model’s focal length spans an amazing 28mm-504mm (in 35mm camera equivalent terms)! Enjoy double protection against camera shake with Dual Image Stabilization. Even at high magnifications or when capturing fast-moving objects, this technology ensures results are significantly sharper. Packing 7.1 Megapixels of detail-capturing power, the SP-550 UZ opens up a new realm of creative possibility. Explore the possibilities of truly remarkable magnification power. With an 18x wide zoom lens (equivalent to 28-504mm on a 35mm camera) there’s no need to disturb your subject, whether it be an animal wandering through the wilderness or people lounging in a city park. Telephoto shots can be more prone to blur caused by camera shake, so the SP-550 UZ features Dual Image Stabilization to help deliver the clearest results possible. Get a front-row view from a safe distance in high-action situations – and even make use of the phenomenally-high burst rate to take great sequential shots at speeds never before seen in this category: Up to 15 frames per second*! Experience a lens that’s simply more versatile than anything you’ve seen before. On top of astounding ultra-zoom attributes, its wide-angle capabilities stretch to 28mm (35mm camera equivalent). Therefore the SP-550 UZ therefore offers photographers a broader viewpoint from which the photographer can see and do more. And with a 6.4cm LCD it’s easy to frame and capture shots, without having to squint and make guesses about how the image will turn out. See the world from a different point of view with Super Macro mode – making shots possible from as close as 1cm! From the tiniest wonders nature has to offer, to the simple detail of everyday life: The most unique photographic opportunities are easily recorded with the SP-550 UZ. Don’t let low light ruin a photo opportunity. You can rely on BrightCapture Technology to add brightness to any shot, even in movie mode! With the help of an extra-bright LCD, framing dim shots is no problem, making high-quality photo and video capture a reality in virtually any low-light situation. Thanks to an ergonomic design plus the intuitive menu and button layouts, the SP-550 UZ is a delight to hold and just as much fun to operate. With P/A/S/M exposure modes and 23 scene modes available, there’s a perfect setting for every user, and for pretty much any situation. The versatile Olympus SP-550 UZ turns creative dreams into reality. 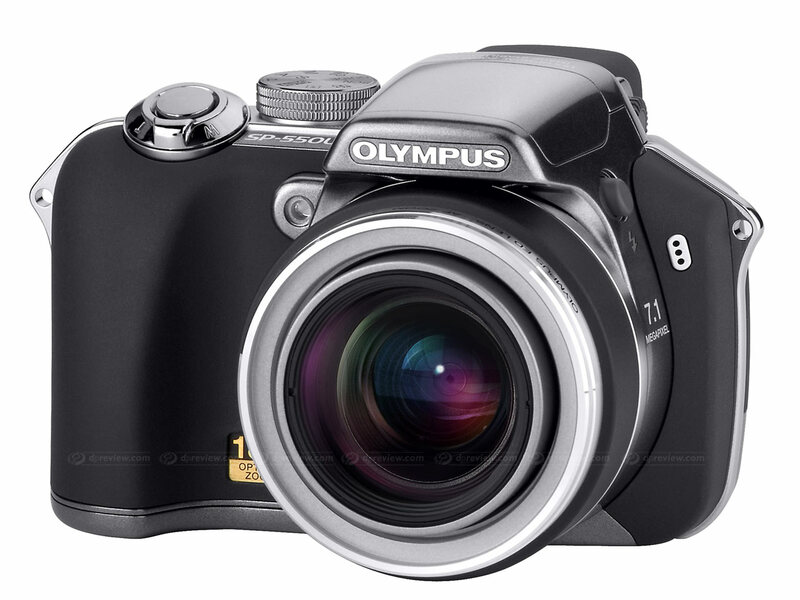 Featuring the world’s first wide 18x optical zoom, this compact camera will be available from February 2007. It is expected to cost in the region of £375 (US price - unconfirmed - is expect to be around $500).